XBRL Filing Services & Financial Reporting - Colonial Stock Transfer Company, Inc.
Colonial's XBRL filing service is a full service solution that provides conversion of your company's financial statements into XBRL formats that are compliant with the US GAAP, IFRS, and Risk/Return Summary taxonomies. Because our service is all-inclusive, you do not need to buy software or hire and train new staff. You can take advantage of the cost savings while our dedicated project managers assist with your XBRL filing from start to finish. Experienced team: Our in-house CPA, accounting, and technical experts are specially trained in the GAAP, IFRS, and Risk & Return taxonomies to ensure best practices are used in the tagging of your XBRL documents. Quick turnaround times: Since our team is in-house and U.S. based, there is no need to wait long periods for new proofs. Changes are made quickly and automated responses are sent on every new filing request. Quality control & validation: You can depend on Colonial's quality control and validation metrics to ensure that your XBRL filings are always complete and error-free. Consistency between files: All changes are updated in both HTML and XBRL proofs automatically. Mapping Documents: We analyze & identify the appropriate taxonomy categories for your financial statements and notes for US GAAP, IFRS, and Risk/Return Summary taxonomies and perform an analysis for the creation of extension taxonomy elements. Tagging and Validation Services: Our team tags and creates a valid instance document and other related files. Mapping Report: We provide a comprehensive Mapping Report for corporate accountant's for your review, feedback and approval. Incorporating revision requests: Our team incorporates any changes at no extra cost. Submission: Our fully validated files are submitted to the SEC and other appropriate audiences. Our corporate XBRL filing services are provided for corporations that are required to file interactive data to the SEC. See SEC release 33-9002. 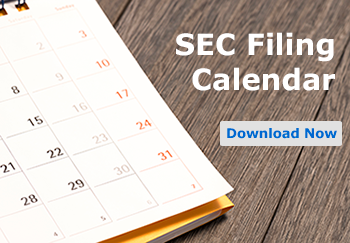 We prepare and file XBRL for Mutual Funds to the SEC under Investment Management Rules 485 and 497. See SEC release 33-9006. Contact a sales representative to obtain a quote or learn more about our XBRL filing services at 877-285-8605.